The 19th Century saw a rise in the number of comic periodicals published. 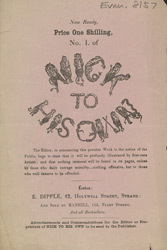 Comics like Nic To His Own, featured on this leaflet were written primarily to entertain the lower and middle classes. There was a great need at this time for escapist entertainment; working and living conditions were tough for a lot of people and humour was one way of coping with these. Comics contained jokes, verses, riddles, cartoons, caricatures and satire. They actually did a lot more than just making people laugh, they often made reference to current events and dealt with very serious political and social issues like working and living conditions.